“Company” means JB Personal Training, “Member/Class User” means any person that has ticked the Terms and Conditions box online which has been accepted by the Company. “Venue” means any of the venues used by the Company as published on our website(s) from time to time. “Terms and Conditions” as defined here. 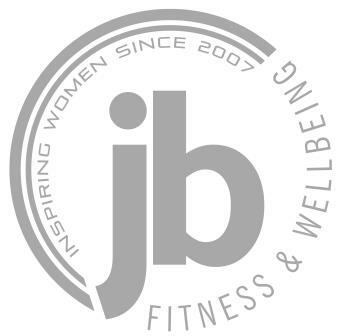 “Website” means www.jbpersonaltraining.com or affiliated websites. 1.2 The Terms and Conditions are incorporated into the online booking system. 1.3 The Company reserves the right to vary or revoke any of the Terms and Conditions from time to time which it may consider necessary or suitable for the regulation of the governance of the Venues and the conduct of Members. Any such changes will be published on our websites and, until revoked, are binding on Members. 2.1 Subject to condition 2.2, when a person has ticked the terms and conditions on-line they shall become a Member of the Studio or a studio user. 2.3 The Company reserves the right to withdraw, suspend or refuse to renew the membership of any Member or User whose conduct is, or may deemed to be in the Company’s reasonable opinion, injurious to the character of the Studio or amounts to a breach of the Terms and Conditions or where such expulsion is otherwise to be in the interests of the other Members of the Studio. Any Member so expelled shall forfeit all privileges to membership and shall not be entitled to any refund for any period during which his membership is suspended. 2.4 The Company may run promotional introductory offers from time to time (directly or through an Agent). These offers are exclusively for New Students who are not already registered (“Members/Users”) with the Company and are not for repeat use. 2.5 All members must be over 18 years old on the membership start date. Details of class and club times at the Venues may vary from time to time. Class times will be published by the Company on our Website. 4.1 Details of class prices and memberships are available on our website(s) or shall be such prices as determined by the Company from time to time. 4.2 Subject to any statutory right of cancellation, payments for classes, courses, monthly subscription fees and annual payments are made non-refundable unless otherwise stated in the Terms and Conditions. 5.1 The provisions of this clause 5 shall only apply to Members that subscribe to memberships entitling them to a specific number of classes per month by monthly or yearly autopay (“Subscription”). 5.2 Subscription fees must be paid in accordance with the Terms and Conditions irrespective of whether or not the Member attends the Company’s classes or clubs. 5.3 Members shall be given no less than 28 days’ written notice of any increase in their Subscription (unless otherwise agreed in their contract). There will be no increases to the monthly subscription charge within the minimum contract period. 5.4 Any Member that is purchasing classes by Subscription cannot cancel their Subscription before the expiry of the period of 12 months from the date of their initial payment pursuant to the Subscription (“the Minimum Subscription Period”). 5.5 After the expiry of the Minimum Subscription Period a Member may cancel their Subscription at any time by written request to the Company, giving one calendar month’s notice from the desired cancellation date. 5.6 If a Member does not pay their Subscription for the Minimum Subscription Period (or cancels their Subscription during the Minimum Subscription Period) then the Company is entitled to charge the Member for any outstanding Subscriptions in respect of the Minimum Subscription Period. 5.7 Members agree and acknowledge that by agreeing to the Minimum Subscription Period, they are being given preferential rates by the Company and therefore it is fair and reasonable that the Company charges them for any payments as described and referred to in 5.6 above. 5.8 It is the sole responsibility of the Member to cancel their monthly autopay with their bank on termination of their Subscription. The Company cannot be held liable for any payments processed due to the failure of a Member to cancel their autopay. 5.9 Members who do not wish to accept a change proposed by the Company to the Terms and Conditions or to pay an increase in any Subscription fees may cancel their Subscription by giving written notice to the Company. The notice must be given before or within 28 days after the change to the Terms and Conditions or increase in subscription fees takes effect and must expire at the end of the relevant calendar month. The Member giving notice must continue to pay subscriptions at the rate current immediately prior to any proposed increase until the end of such notice period. Personal belongings are brought into the Venues at the Member’s risk and the Company does not accept liability for any loss or damage whatever to such items. For security reasons Members are advised to take personal belongings and valuables into the room being used in the Venue and not leave them elsewhere in the building. 8.1 Early Cancels – If you cancel more than four hours before the start of class (lunchtime and evening classes) or before 10pm the night before (early morning classes) there is no penalty applied. This allows waitlist students to be contacted and join the class. 8.2 Late Cancels – If you cancel within 4 hours of the class start time (lunchtime and evening classes) or after 10pm the night before (early morning classes), you will lose the credit for that session. Contract Members: You will lose the session credit for not cancelling and not attending a pre-booked class.. Please remember that you must go to our online booking system and remove yourself from the class list or email or text us if you cannot attend a class. • Classes can be booked online or via the MindBody App up to two months in advance. • Silver Members have a monthly entitlement of 10 session credits per month in addition to complimentary Run JB Membership, Mindful Eating Group and Couch to 5K attendance. • All students with online bookings must sign in before the class starts. Late Entry will be allowed any later than the class start time at the discretion of the Instructor. • If a class is fully booked, you can check in throughout the day to see if a someone cancels and a space becomes available. 9.1 Members are advised not to undertake strenuous physical activities without first seeking medical advice if they have concerns over their physical condition. The Company reserves the right to refuse access to any Member if, in its absolute discretion, it considers that the health of the individual concerned may be endangered by the use of such facilities. 9.2 Members are required to complete a Physical Activity Readiness Questionnaire, which will be sent to them via email on joining, prior to participation in any of the Company's classes. If there is any doubt as to the physical readiness of the Member to participate, the Member should consult his doctor. Members and their guests must notify the Company of any circumstances affecting their health which may be exacerbated through continued participation in the Company’s classes. 9.3 Members are required to follow the instructions of the instructor at all times. Members are requested to wear a form or dress and footwear appropriate to the practice of the class or club session in which they are participating. 11.2 No crockery, glass or food is permitted in the Venue. Only water is permitted in the Venue. No children are permitted on the premises. Do not walk around the Venue, changing rooms or showers barefoot (please wear flipflops) if you have foot complaints. Members must use the appointed entrance to the Venue when entering or leaving the Venue. Fire exits, which are clearly marked, are there in the interests of safety and Members must not interfere with these doors for any reason. 11.3 Members are welcome to use a suitable towel to cover borrowed exercise mats in the studio or alternatively purchase or bring their own mat to exercise. 12.1 Members must at all times observe the Venue guidelines which may be notified to them from time to time and are requested to comply with any reasonable directions which the management of the Venue may issue to ensure the smooth operation of the Studio for the convenience of all Members. 12.3 The Company reserves the right to refuse admission to the Venues. 12.4 The Company may, if a Member so wishes, communicate with the Member by electronic mail (“email”). By providing an email address to the Company the Member consents to receiving email communications from the Company, including notices pursuant to the Terms and Conditions. The Member also accepts any risk that email may not be a fully secure and confidential means of communication. The Company will not be liable for any loss or damage suffered as a result of communicating with a Member in this manner. 13.2 It is the Member’s responsibility to ensure that they are capable of undergoing a routine of exercises provided by any programme that they follow or class that they attend. Members accept the risk of injury from performing exercises and are advised to consult their doctor prior to beginning any programme or class. The Company accepts no liability for loss or damage to property or injury of Members or their guests to them in or outside the Venues except in so far as such loss, damage, or injury is by law incapable of exclusion.